Benefit from an efficient, innovative and user-friendly pharmacy management solution (PMS) which can evolve with your needs. Kroll™ is a robust solution, used by chains, banners, independent pharmacists and other specialized clinical settings for more than 30 years. Take advantage of an automated dispensing workflow including audit trails and reporting to help free up pharmacists’ time for patient consultations. 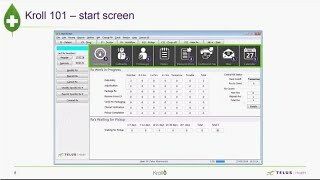 Configure Kroll™ to meet the unique needs of your pharmacy. Help improve patient, doctor and payer management activities, and leverage shortcuts for the most frequent steps. Help reduce the potential for dispensing errors with built-in adverse drug event detection, support for allergies and medical conditions, barcode scan verification and more. Kroll™ helps pharmacists optimize operations and enhance customer experience. Improve your processes with features such as Rx filling (patient, drug, doctor, and SIG), adjudication, label printing, inventory, accounts receivable, extensive reporting, audit trails, a wide-ranging SQL database and more, all based on an intuitive Windows design. Kroll™ integrates and is compliant with provincial drug information systems. This allows pharmacists to leverage the provincial patient profiles and provider registries in order to have a comprehensive view of their patient’s drug and demographic information. At TELUS Health we believe in transparency. Our testimonials come from actual clients who have used our products and are willing to share their experiences. "What I enjoy most about Kroll™ is its ease of use, convenience and pharmacy management functionalities. That’s why I would recommend it to other pharmacists." Benefit from a well-known and established solution. Many Canadian universities and colleges use Kroll™ to teach tomorrow’s pharmacists and technicians. Even if an employee is new to Kroll™, it’s intuitive and easy to learn. With over 30 years of experience providing customer satisfaction, Kroll™ is a robust solution. Its rich set of features can be configured to meet many of your pharmacy’s needs. Take advantage of a pharmacy management solution that’s constantly evolving to support the changing needs of pharmacists and their patients. Feedback from our large client base gives us the insights to constantly improve. Learn more about Kroll, pharmacy management solution, including how it can be customized to fit most of your pharmacy’s needs and processes. 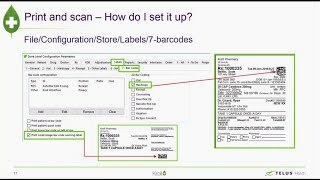 This webinar session covers the Kroll system including its advanced features and options for conversion from your existing system. Simplify and synchronize daily tasks across stores and labs with an integrated POS and inventory solution that automates labour-intensive processes. Get electronic prescriptions and send renewal requests directly in your Kroll™ pharmacy management solution. Get training materials, videos, user guides and policy documentation in one place.